From the original Honda FireBlade, to the ultra-rare Bimota V-Due 500, the ‘90s brought us some special sports bikes. Used prices of many of these ‘90s icons are rising, but some of them can be snapped up for decent money. 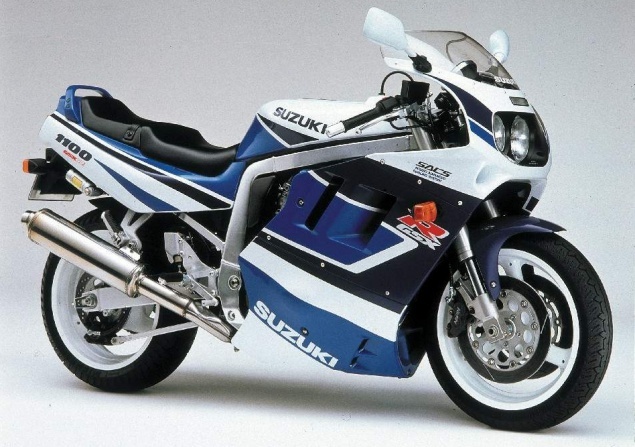 Our expert takes a look at some of the greatest nineties sports bikes. 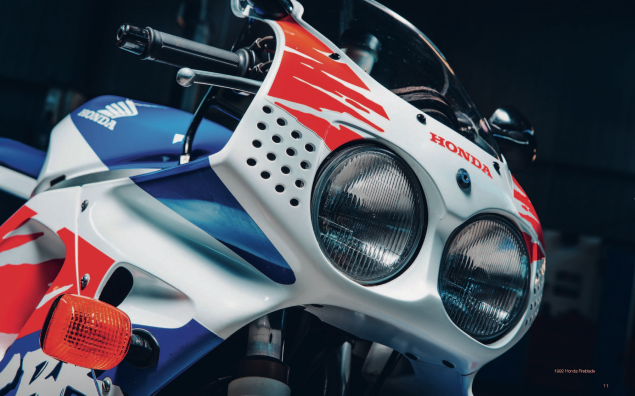 It’s the bike that set the ‘90s sports bike world on fire. In truth, there wasn’t anything too radical about the technology but the thinking behind its design was clever and of course, they remain one of the most iconic sports bikes in history. A mix of a lightweight blended with enough power to bring it all to life, the original Blade bucked the trends of the time and went with a 16-inch front wheel to give it an edge in the handling department. Compared to every other previous production the bike looked clumsy and bloated but the original 1992 RR-N is the jewel in the Fireblade crown. Subsequent models lost the edge of the original groundbreaker, with the only exception being the 1994 RR-S Urban Tiger model. These fifty shades of beige Blades are now very desirable and it’s getting tough to find an original machine in excellent condition. PUB FACT: The holes that were pre-drilled to the upper fairing and leading edge of the belly pan panels are there to make sharp left-to-right turns more aerodynamic. 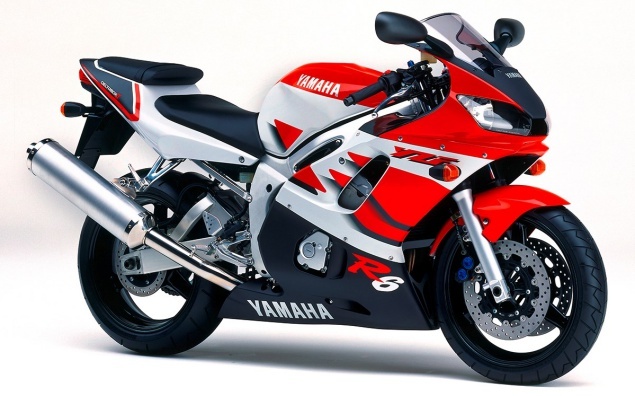 Yamaha wanted a piece of the FireBlade when they came out with the first YZF-R1. And that’s exactly what they achieved in 1998, except the R1 had a lot more power to offer than the Honda. 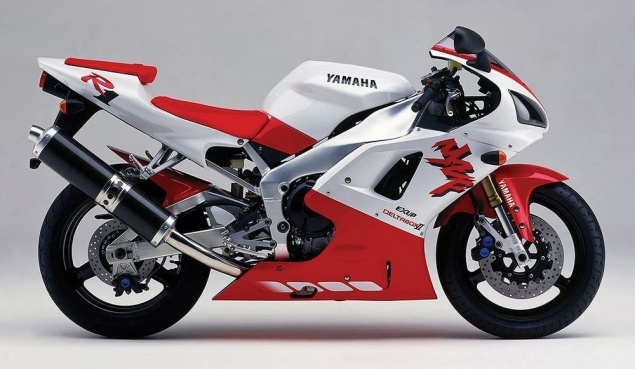 The 1998 Yamaha YZF-R1 4XV model was an all-new design that looked superb, went like stink and, more importantly, had the handling to match. It wasn’t until the early noughties that it would face stiff competition and for many, it represents the ultimate carb fed litre sports bike. Offered in a stunning red and white, or solid metallic blue finish, it also confirmed the Japanese manufacturers had finished with their awful shell suit paint jobs. The R1 engine was good for a genuine 140 bhp and there was more power to be liberated with the addition of expensive flat slide carbs and race exhausts. PUB FACT: The fairing panels on the R1 are much thinner than those on other ‘90s motorcycles, they are prone to cracking and splitting, especially around the mounting holes. With its Suzuka 8-Hour Endurance race looks, and a chassis that boasted upside down forks, six pot brake calipers and a six-inch wide rear wheel, the ZX-7R did little to hide its intentions. Truth is, it wasn’t the sharpest 750 of the era, but it was one of the best-looking bikes that Kawasaki made in that decade. 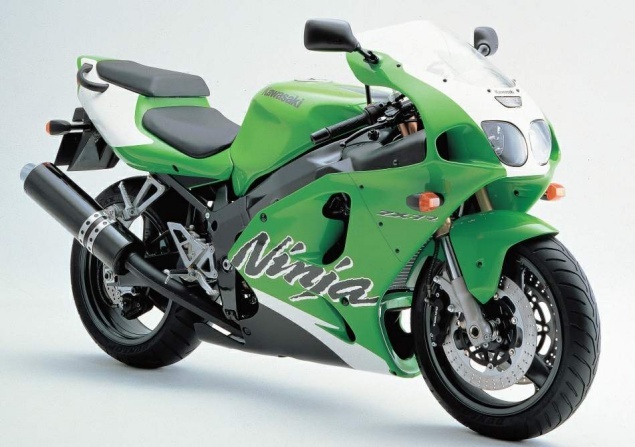 The ZX-7R went on to be part of the Kawasaki range well into the new millennium. The only changes were purely cosmetic colour changes. The lime green bikes look the sharpest, but the jet-black versions look pretty damn handsome. Overall styling was a bit on the tubby side, which is exactly why it’s popular with taller riders who want a nineties 750 sports bike fix. Owners have been getting passionate for years now. Standard bikes are hard to find, so instead, most ZX-7R fans spend good money on a quality suspension kit and race pipes to keep their beloved 7Rs in the hunt. PUB FACT: The ZX-9R B model engine is a straight swap for the ZX-7R engine. You’ll also need the header pipes, carbs and wiring harness. The early ‘90s was a golden time for the sports 250, little did we realise at the time that the demise of the two-stroke 250 wasn’t too far away. There was no shortage of hot two-stroke 250s to choose from, and picking a favourite often came down to brand loyalty. Suzuki definitely picked up a few new customers when they gave the world the RGV250M. The earlier K and L models were great pocket rockets, but the M arrived wearing even more race track inspired tackle. The upside-down forks added kudos and a bit of weight when compared to the conventional forks on the earlier model. The banana swinging arm was designed to allow the two fat exhaust chambers to tuck up under the bowels of the bike. The tail light was a scaled down version of that on the GSX-R1100 & 750M models. The miniscule V-twin engine was good for 61bhp in standard trim. Two-stroke tuners could release more power with their skills and magic files, but this usually cut life expectancy of the engine dramatically. That wasn’t an issue on pampered race bikes, but not a great idea if you wanted hassle free road riding. The blue and white bikes look the best and tend to fetch more second hand, unless you can find a genuine Japanese home market Lucky Strike model which are rare as the proverbial. PUB FACT: The later RGV250 P, R and S models came with a double braced swinging arm. The gorgeous banana swing arm was only fitted to the M and N models. Without doubt one of the most iconic looking motorcycles of all time. The Ducati 916 is an undisputed classic of the modern age. The L configuration water-cooled engine pumps out just over 100bhp in standard trim and with a weight of 198kg, it will run on to a 165mph top whack. The steel trellis frame might look like it came from an earlier decade, but it was more than good enough to deliver Ducati a rake of WSB wins and championships in the hands of Carl Fogarty. 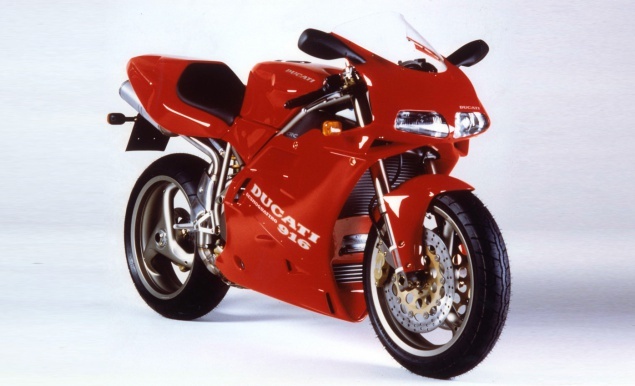 From its launch in 1994, Ducati never stopped fiddling with the model. The most common model is the twin seat 916 biposto. With rarer, and more expensive SP, SPS and several Senna models you really need to know your onions if you want to buy one. Do your homework and consult your bank balance. Keeping that 8-valve twin cylinder engine going can be an expensive business, especially with the bi-annual cam belt changes. PUB FACT: The hotter Ducati 916 models came with all manner of goodies, these included alloy sub frames, Marchesini wheels and some models even had titanium con rods. For many, the up over cradle framed GSX-R1100s hold special memories. 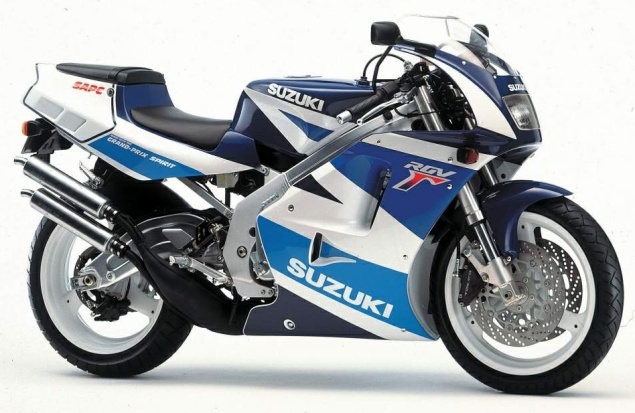 The GSX-R1100M was the last revision of the oil-cooled engine shoehorned into the out of date chassis. With the arrival of the FireBlade, the ‘90s taught manufacturers that it wasn’t all about brute horsepower, a road that they’d all been travelling, albeit in different directions over the years. Once seen as a vision of the future, the tubby GSX-R1100M could still spit out an 11 second quarter mile time but it was a right handful when the going got twisty. The 1127cc engine is a gem and over twenty years later it’s still in demand by drag racers and classic racing teams. Everything about the Slingshot 1100 is big, also very chunky. The flushed in trademark twin headlights live behind a thick piece of glass, yes it looks great, it also weighs a fair bit. Technically, feeding fuel to the awaiting 8 inlet valves are a bank of whopping 40mm Mikuni carbs. The multi adjustable forks and shock created more problems than they ever solved. If you own any GSX-R1100 model, investing in suspension surgery is money well spent. PUB FACT: Suzuki XR69 replica racers at the classic TT are now eligible to use the GSX-R1100 oil cooled engine. 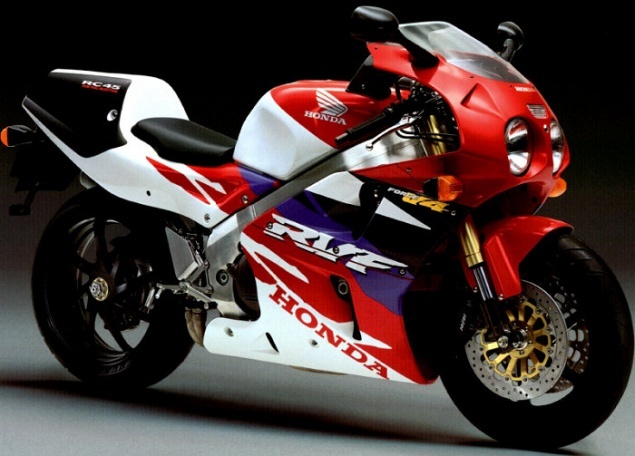 The Honda RC45 is the RC that some people love to hate. Honda needed a replacement for their road-legal RC30 racer, and in 1994 they unveiled the RC45 complete with its £18,000 price tag. On the road and the race track it never really lived up to the gauntlet thrown down by the RC30, but that doesn’t make it a bad bike. Everyone had upped their game, but one area where the RC45 was head and shoulders above the competition was its attention to detail and overall finish. The V4 engine is a legend. It delivers its 120bhp across the entire rev range, unlike rev hungry across the frame four cylinder four strokes of the time. The close ratio gearbox can be a pain around town, but find the open road and it all makes sense. For most, it will always live in the shadows of the Honda RC30, but viewed in isolation, there’s no denying that the 45 is a lovely piece of kit. PUB FACT: Honda moved the gear driven cams to the side of the engine on the RC45, this allowed them to shave a few millimetres from the width of the V4 motor. The 600cc class often saw technology from bigger machines in the range trickle down to these middleweight marvels. No bike highlights this more than the original R6. Honda had pulled the roost with their Jack of all trades CBR600, but Yamaha weren’t interested in appealing to everyone with their all-new lithe four cylinder 600. It’s links to the bigger Yamaha YZF-R1 were much more than skin deep. The R6 used the same blue spot four pot front brake calipers that the big boy R1 employed. The R6 was the first production 600 to break the 100bhp barrier and Yamaha quoted an insane 120bhp, but the reality was more like 108bhp. The alloy frame was a first for Yamaha on a 600cc machine. Their previous Deltabox frames in this class had used steel constructed frames that were painted silver. The motor’s 15,500rpm red line gave you a big clue that the R6 needed to be spanked hard to get the best from it. The power comes in just like a two-stroke, with spikes in delivery at 6000rpm and 10,000rpm before running on to that dizzy red line. PUB FACT: The R6 gearbox can give aggravation, in worse case scenarios you can lose 2nd gear completely. The good news is it’s usually just the detention spring breaking, the bad news is you need to split the engine to fix it. With the emission police arriving to call time on sporty two-strokes, this left a gaping hole in the market for those who wanted an up-to-date pocket rocket. Kawasaki sold the ZXR400L alongside their KR1-S initially, but once the stroker vanished from the yearly brochure, it was left to the ZXR400L to step into some big shoes. 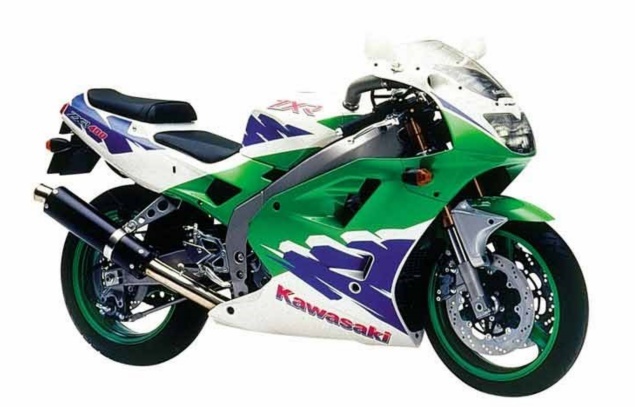 Like the ZX-7R, it stayed in the range for years receiving nothing more than some fresh graphics here and there. The ZXR400L satisfied the needs of those who wanted their thrills on a smaller capacity machine. Such was its brilliance, that it even tempted people away from 600cc and bigger machines. Helping to convert people was the impressive spec. The ZXR400L wore upside-down forks along with its sleek looking lines. The biggest grins came once on the move. The almost two-stroke like power delivery was actually part of its attraction and charm. The 398cc inline four produced 62 bhp which was good enough to propel it to a genuine 140mph top speed, and not too shabby for a 400cc motorcycle. PUB FACT: The ZXR400L was the second generation of the model. The earlier ZXR400H model was sold on the Japanese domestic home market. Not every great bike is actually great. For all of its many shortcomings, the Bimota V-Due 500 remains to live on in people’s hearts like some kind of two-wheeled DeLorean unicorn. The whole project might have been flawed from start to finish, but there’s still something tantalising about a fuel injected 500cc two-stroke twin with the Bimota name on the chassis and the engine. 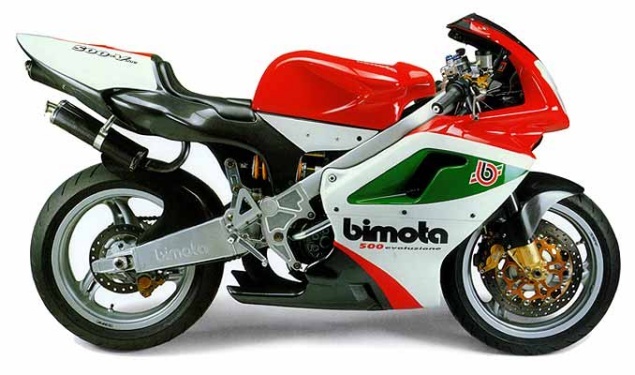 Bimota had built a reputation for creating bespoke chassis kits for some of the best engines that left Japan and other countries., for years. After several years of engine development Bimota put their V-Due into production in 1997. Records reveal only around 15 bikes were shifted that year. The bad news is that a dozen were returned to the factory by owners demanding refunds. The issues were all related to the 500cc V-twin engine and its crude fuel injection system. Bimota, as we’d come to know them, never recovered from their flight of fancy. Twenty years later, and the handful of V-Due’s that survived are still a bike that any two-stroke junky would consider buying if they had a lottery win. And it’s no surprise that TV’s very own petrol head, Guy Martin, has one in his shed running on carburettors instead of fuel-injection. PUB FACT: The V-Due’s original engineer, Piero Caronni, purchased the legal rights to the bike and all of the unsold bikes and parts and set up on his own. Caronni junked the troublesome fuel injection in favour of Dellorto carbs. ZX7-R no.. should be the ZXR 750 J1-a better looking bike and a purer design-practically the same bike.. not as massively bulky as the 7R….. read more ZX7-R no.. should be the ZXR 750 J1-a better looking bike and a purer design-practically the same bike.. not as massively bulky as the 7R..